The Ural Cossack Host, formerly known as Yaik Cossacks, were one of many who were serving the Russian Tsar by the middle of the 19th century, when Britain and France invaded the Crimea. While the war in this region was primarily a siege, and so not well suited to cavalry (with a few famous exceptions of course), much use was made of Ural and other Cossacks in their traditional light cavalry role, and were increasingly used like regular cavalry too. 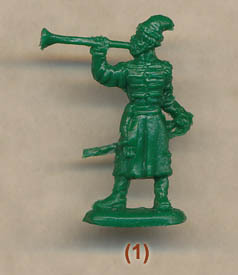 Prior to the release of this set Strelets had already produced two sets of Cossacks for the Crimean War – their Terek Cossacks and their Don Cossacks. The Terek Cossacks, being Caucasian, had a distinctive appearance, while the set of Don Cossacks, which could more generally represent many Cossack hosts, suffered from having a dress uniform rarely seen in the field. With this set of Ural Cossacks the hope was that Strelets would deliver typical Cossacks as they would actually have appeared on the battlefield. The first reaction to the figures is good. Apart from the Caucasian Cossacks, the rest wore a tall peakless shako which was often covered by an oilskin, and that is what we find here. Indeed it was common for the men to wear just the oilskin, without the shako underneath, and these figures could be doing either. The other good news is they are all wearing the normal greatcoat, which hides any uniform underneath but was very practical and almost universal amongst the Russian forces. With these two simple items these men are almost entirely covered, so while the uniform may not be colourful or exciting it is a true reflection of how such men actually appeared. The officer wears a popular peaked cap and has officer epaulettes, but he too wears the coat and also looks accurate. All the men have carbines, which are slung across the back when not in use, and also a cartridge pouch on a shoulder belt, so historically everything here looks good. The horses are exactly the same ones as are to be found in the other Cossack sets mentioned above. The relatively simple saddles and bridles look properly done, but we continue to feel that they are not a good representation of the smaller, sturdy animals the Cossacks traditionally rode, which had more of the look of ponies about them. Some of the poses are not great either, although by no means the worst this company has produced. However it is the look of the animals that has cost this set an accuracy point as the men are fine. Naturally Cossacks carried lances, but were also armed with carbines and pistols, and of course their traditional guard-less sword – all weapons which we find in this set. We were pleased to see a third of the poses holding a lance, although having three figures with pistols seemed quite a lot. Pistols were short-range weapons, and since most of the horses are clearly moving quickly there would be little hope of anyone hitting anything with a pistol under these circumstances. Two are holding their carbine, which is good, and the remaining three (including the officer) are holding their swords. The poses are the usual fare from Strelets, which is what you might expect, and all of them are pretty useful, though ideally there should have been more walking or stationary horses, particularly for those firing from the saddle, as we have already said. The sculpting is perhaps slightly better than the previous sets, though with the usual Strelets features of a fairly chunky feel and a little roughness at the edges. The poses are all quite straight-backed, which does little to give the impression of cavalry at full charge, but the proportions are OK and there is almost no flash anywhere. Some of the men are a very tight fit on the horses, however, which in some cases is a serious impediment to actually getting the man to stay on his mount at all. Also these figures are noticeably taller than the usual; Cossacks were described as short and stocky, much like their animals, but these are rather too tall for our liking, though the discrepancy is not massive. On the whole our hopes for this set were fulfilled, in that they depict just about any of the non-Causacian hosts in the uniform that they actually wore on the battlefield. In many ways this makes them better Dons than the previous set of Dons, so are by far the most useful of the Crimean Cossack sets thus far produced. Annoyances like the height of the men and the excessively splendid animals, plus the difficulty of getting some men to sit in the saddle, mean this set is not without faults, but it is a long-overdue addition to the Crimean War range and fits well with the rest of the Strelets range.